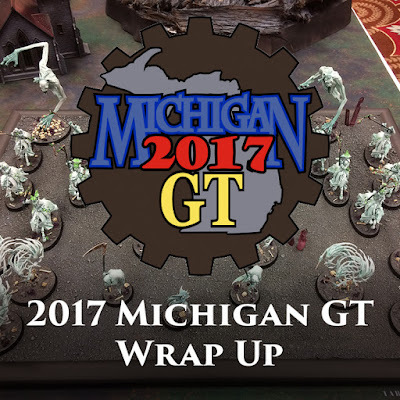 Another Michigan GT has come and gone, and I once again took a Death army to the Age of Sigmar tournament, this time of the ghostly variety. 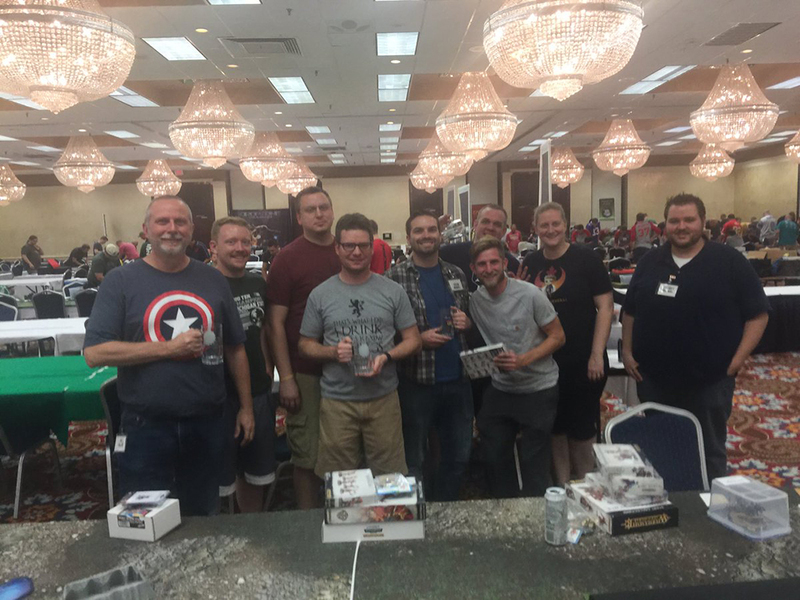 This is the first major tournament under the new General's Handbook for me and my Nighthaunts; so five games later, how did they fare? This was the tournament that I was aiming to get my Nighthaunt army done for back when I set my painting deadlines, so it was very rewarding finally getting to take them. I originally had hoped to get a more impressive display board done in time for them, but it had to be put on hold, so I opted for a much quicker board instead. This required a $5 cork board from a craft store, some sand glued down and painted, some cool purple crystals pushed into the cork (I didn't even glue them), and a last minute Arcane Ruins piece painted up. All in all I think it did the job admirably, but in future events my Death army will be traveling in style on a fully decked out display board. It's done well for me so far and I was happy with it going in. There are a few changes I would probably make to the list now after the tournament, but I'll go over that at the end. A few quick words on the GT before I get into the game. 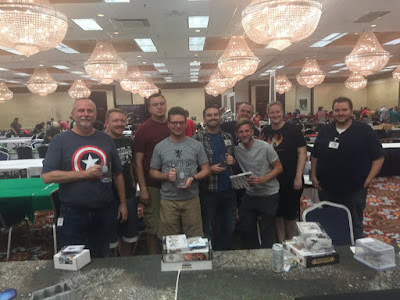 This is Michigan's premier gaming event, with tournaments for a multitude of gaming systems, so it was really great to see such a great turnout for the AoS tournament, at 25 people, which is more than last year. It seems to really be picking up steam so I expect next year to be even bigger. We had people coming from out of state too which is great, including from Wisconsin and the Minneapolis area. So a big thank you to everyone who travelled so far to the GT. Ok, now onto the games. First off, his army was pretty cool looking, with all of the big beasties and plenty of conversions. He deployed his army in two chunks, basically the dragons all on one side and everything else on the other. I left my Mournguls in the underworld, along with my small unit of Spirit Hosts and a Banshee. I got first turn and brought in all my underworld units as close to him and his objective as I could, while my Hexwraiths raced up the flanks to grab the two middle ones and the rest of my army moved up a little bit while still staying within range of my own objective. My banshee near him did a bit of damage with her scream, but in the charge phase I got one of my Mournguls and the Spirit Hosts in. The hosts managed to do enough damage to bring his unit closest to his objective below three, allowing my Spirit Hosts to claim it, while the Mourngul hacked away at the other flank. From there I never lost control of all four objectives for the rest of the game. His dragon packs did charge into the center of my army, and man, the Carmine is scary, but I was able to take them down with my second Mourngul and 12 Spirit Hosts re-rolling missed hits thanks to the Lightshard. It was a really fun game and a great start for my Nighthaunts. This was my first time playing against the Kunnin' Rukk, so I was a little nervous considering everything I've heard about it. I deployed almost everything on the board, including my Mournguls who were positioned as close to the objectives as I could get. His army deployed mostly in the center, with the Savage Orruks and the Brutes off to the flanks. He finished deploying first so got to choose first turn and gave it to me. My first turn was mostly just me running everything forward. My Mournguls both got onto the objectives, and I ran heroes up behind them so they benefited from the "Death Save." On his turn he moved everything forward as well, and did his two rounds of shooting with his Rukk. The scenery and range prevented him from throwing all of it at one Mourngul, so he split the shooting between them and some of my Spirit Hosts. The Mourngul was tough though, and my dice were hot, so I made most of my saves. The Brutes went into the Mourngul on my left flank, and over two or three rounds were taken out. The Mourngul on my right flank took the charge of one of the Gore-Grunta units and some Savage Orruks. He wiped out the Gore-Gruntas and was able to weather the rounds of shooting and combat until the end of turn four when he finally died. In the center my large block of Spirit Hosts took out the other Gore-Gruntas, and then charged into the Arrow Boyz along with one of the units of Hexwraiths to try and bring their numbers down so they'd get less bonuses. At the end of turn four, after one of the Mournguls finally died and he was able to secure an objective we looked at the score and there was no way for him to catch up after four turns of me accumulating points, so we ended the game. I had a lot of fun in this one, and unfortunately for Wally, his dice weren't rolling so well (the Rukk only managed to do a bout 10 or so wounds a turn to my Mourngul, which after all my saves amounted to about only one or two actual wounds, which I then healed back in combat). This was a tough game for him from the get go, because if there is one scenario that the double Mourngul list is an absolute star at, it's Duality of Death. I knew this was going to be a challenge right away. Muderhosts are nothing to joke about, and all the mortal wounds the Bloodletters dish out get right around my whole ignoring rend thing. Since the objectives don't come on till later in the game, I was able to deploy in a denial method as opposed to getting ready to grab objectives. My two units of six Spirit Hosts and the Wraith with the Lightshard deployed right along the back edge of my board, well out of charge range of his Bloodletters even with their extra move. My Hexwraiths deployed along the flanks, each with a Banshee nearby. Everything else was kept in the Underworld. He mostly deployed in the center, did his bonus move and gave me first turn. I brought both of my Mournguls in on my right side, right in front of one his Bloodletter units. My idea was that if I could get both of them into combat, I might have a chance of neutering them. 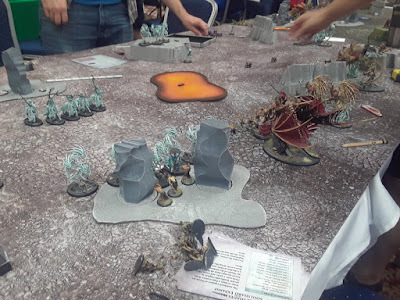 My Hexwraiths then ran, racing in a line towards the center of the board, effectively creating a screen that he would have to charge though to get to my Spirit Hosts. Well, I failed both of my Mourngul charges, which meant in his turn they, of course, got charged. He focused all his attacks onto one Morungul and severely wounded it, but was unable to kill it. Over the course of the next few turns one of my Mournguls died and all of my Hexwraiths died, but I was able to pretty much decimate the unit of Bloodletters on my right side. My Spirit Hosts counter charged and thanks to the Lightshard were able to kill the other unit and his Bloodthirster. My last Mourngul eventually died to Flesh Hounds, and two of the meteors came down on the right side, right where his army was clumped, making it so it was easy for him to grab, and hard for me since I was tied down in combat over there. The meteor in my deployment zone came down in the opposite corner, so I grabbed that one no problem. Over the rest of the game I started to tear apart the rest of his army, but I wasn't able to get ahead in points. It was a super close game right up until the last turn and I really enjoyed it. I'm happy that my deployment strategy worked out so well too. Jake had some terrible dice rolls for his Slaughterpriests the whole game, which mean they never once got their Killing Frenzy off, which definitely helped me. In fact, one of them killed himself trying to do the prayers, and the other almost killed himself. I don't know what I would have done differently here, everything pretty much went the way I planned it for except for a few areas. The placing of the meteors just made it really hard for me to grab them at first. If one of them had fallen in the middle I think I would have had a much better shot. Knife to the Heart was the only scenario from the new General's Handbook that I hadn't played yet, so I was going into it a bit blind. I knew Skyborne Slayers was going to be a tough matchup in this game since he could just drop half his army right near my objective. I decided to play agressivelly and kept both of my Mournguls in the underworld along with my small unit of Spirit Hosts and a Banshee. I deployed my Hexwraiths grouped together in a woods, ready to run forward later in the game and grab his objective and my two units of six Spirit Hosts in a ring around my objective, ensuring there was no way he could get within 6" of my objective with enough of his models to claim it. I was given the first turn and attempted to bring in all of my underworld units, but failed some, even with my re-rolls. The Mourngul failed his charge, but my small Spirit Hosts got into his Judicators. All he had on the board at that time was one unit of Judicators, the Prosecutors, Raptors, Aetherwings, Venator, and Relictor. I had hoped to swamp his objective early on and force him to play defensively, but I failed too many key rolls. On his turn the rest of his army came in, right between my defensive and offensive force. The Protectors and Liberators managed to take down my Mourngul over two turns of combat, while with the help of a crucial double turn he managed to snipe out all of my characters, meaning there was no way for me to bring on my second Mourngul. My Hexwraiths got caught in combat with the Decimators, and one unit fled while the other eventually died after taking out a lot of the Stormcast unit. One of my units of Spirit Hosts wiped out the Liberators and Lord-Celestant near me (thank you mortal wounds), before dying as the Protectors and the rest of the army began their slow trek back across the board. I knew there was no way for me to get a victory out of this anymore, so instead I decided to play for a minor loss instead of a major loss. All I had to do was deny my objective to him and I still had six Spirit Hosts and five Hexwraiths left. I moved the Spirit Hosts out in a half circle in front of my objective and then strung the Hexwraiths out in another half circle in front of those. This was on the bottom of my turn four, and then I won the initiative. There was no way for him to get through to whole units in combat with his army and get five models in range of my objective in the time left, meaning the game was done. At this point I was in the lead for Best Death, and I knew before game four I was in second place overall due to paint and sports scores. There was only one other Death player there, Rob Reid, and I was paired up against him for game five. Essentially a battle for the Best Death award. No pressure. 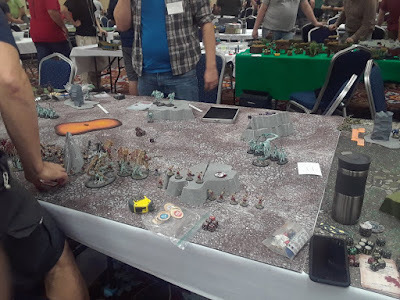 I think Scorched Earth is a really fun scenario to play, and with my Nighthaunt's ability to pop up anywhere on the battlefield I thought I had a good shot at it. He castled most of his army around the center objective, with the outer two objectives held by some zombies. I once again got too aggressive with my deployment, and kept all of my army in the underworld besides the Hexwraiths and three of my characters. He gave me the first turn and I tried to bring on everything. Once again one of my Mournguls failed to come on, so I decided to hold one of my six strong units of Spirits back since my plan wasn't working out properly already. Everything failed their charge on the flanks except for the six strong Spirits, who managed to kill enough of the zombies to claim the objective which I promptly burned, sadly for only one point. 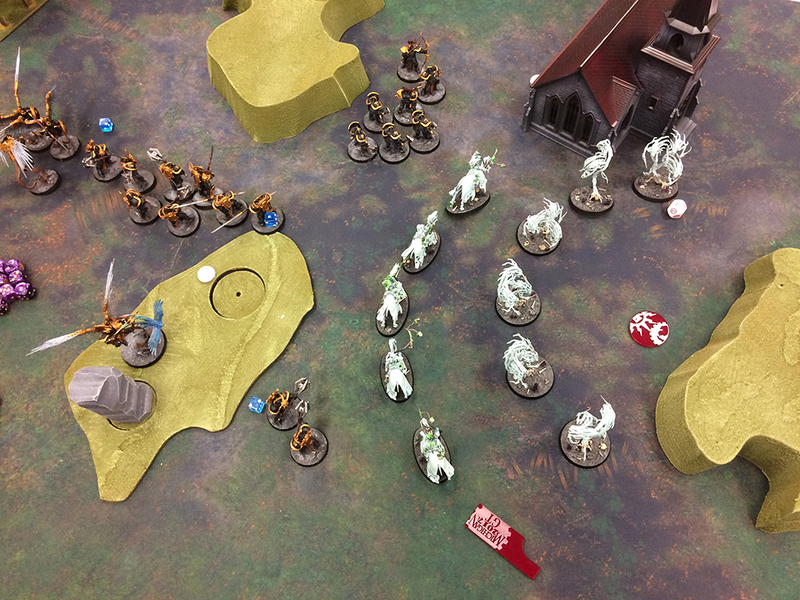 My Hexwraiths had run forward much like I did in my game against Jake to act as a bumper. In his turn he shot everything forward, and with the help of a double turn took out one of my Hexwraith units, and grabbed two of my objectives. In my next turn I brought my second Mourngul on, but failed to bring the other unit of Spirit Hosts on. He basically ran rampant over my lines while my Mournguls took out his other two objectives in his deployment. He decided not to burn my objectives though until the last turn since I didn't really have anything to take them back with, meaning he had a ton more points then me. I failed a bunch of key rolls, and he managed to make every one of his charges, but I also made some huge mistakes at the start acting overly aggressive and he took advantage of it and won. It's fair play to him, he exploited every mistake I made and took out the victory. Thinking back on it I should have just deployed almost everything I had at the start and castled around my objectives and ignored his till the end. Lessons learned and I'll know to play more conservatively in the future. Each of the games also had custom secondary objectives you could pick from. I managed to secure mine each time, which meant I at least had some points, even from a loss. In the end I finished up in fourth place out of 25 people, which I'm pretty happy with. Rob finished right above me at third, with seven more points then me and also took Best Death. It was a really great tournament, and every one of my games was fun and challenging. Even the games I lost were a ton of fun and were tense until the end. A huge thank you to Jeremy for running the tournament, and to all of my opponents, Brenden, Wally, Jake, Zach, and Rob. Brad (Rhellion) took out the top spot and Best Chaos, of course, and I also managed to win Best Large Model in the painting contest that was separate from the AoS tournament with my Tomb King on Chariot. The rest of the Detroit Warhammer Club cleaned up pretty well too, with Al taking Best Painted, Shaun Best Order, and seven of the top 10 spots overall. This was a great first serious outing for my Nighthaunts and I look forward to taking them to more events, although I may switch it up for a more mixed Death force next, just for variety's sake. The few changes I might make to my pure Nighthaunt list, would be finding a way to fit in two more Cairn Wraiths, since I had a few games where all my characters were sniped out before I could bring in all of my underworld models. I don't know what I would drop though, since I want to keep everything that's in it. I'll have to do a bit of trial and error with them in future games.